Explore the social movements and hip neighborhoods that shaped San Francisco into the city it is today. Visit ground zero for Harvey Milk’s gay civil rights movement, see stunning political street art, and understand how feminists, Latinos, artists and activists have fought, and continue to fight, for the soul of SF. This tour is perfect for those seeking an off-the-beaten-path experience. The tour begins under the big Rainbow Flag in the Castro, known today as Harvey Milk Plaza. With a funky, dapper tour guide, you'll venture past the Castro Theatre, our Art Deco masterpiece and home to sing-a-long screenings, and the historic gay bar Twin Peaks. On 18th Street, pass the rainbow crosswalks to hear about current organizations helping keep the LGBT community safe, and hear how Harvey Milk and friends started a gay rights revolution. Around the corner was Harvey's home and campaign headquarters leading up to the historic 1978 election. 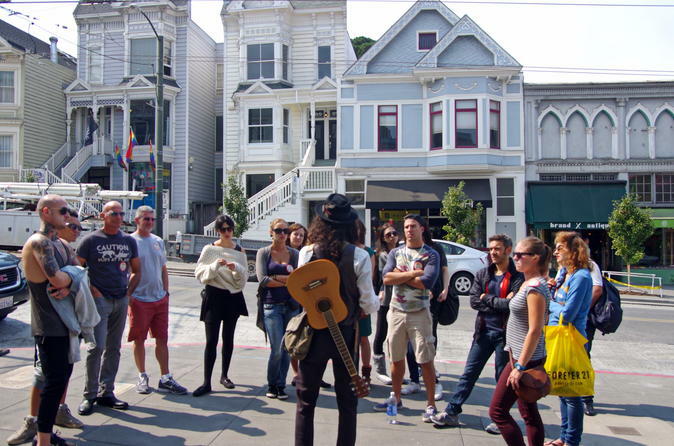 The group next heads to Dolores Park in the Mission District, home to hipsters, families, athletes and dogs. We'll get a sweeping view of the city and learn how the Mission spearheaded a DIY movement that shaped the city. Down the hill we stop at the historic Mission High School, famed for alumni including Carlos Santana and Maya Angelou. On 18th Street we'll see award-winning restaurants, grocers and ice cream shops that define our foodie culture. Further down is the Women's Building, home to a "four story tall standing ovation to women's liberation," a powerful and colorful mural. More street art awaits on the alleys off Valencia Street, then we head past the independent shop corridor of 16th Street and end on quaint Albion Alley, site of the first Spanish Mission church in San Francisco. There is a cafe break about halfway through the tour.